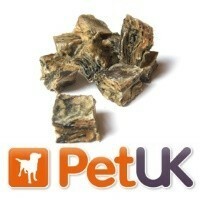 PetUK Advanced Fish Treats for Dogs - Salmon Skin Cubes. Made from only 100% salmon skins, these PetUK Advanced Fish Treats can be given as part of a balanced diet as a daily complementary treat. Each cube is a natrual source of Omega 3 fatty acids and high lean protein; helping to promote a healthy skin, coat and joints. PetUK Advanced Fish Treats are also hypo-allergenic, free from wheat and gluten free so that they are gentle on digestion. This makes them great treats for dogs with sensitive stomachs. Brilliant product. My Staffordshire Bull Terrier has a beautiful shine to her coat and she has stopped limping. The salmon oil in the skins is really helping her. Good value for money also. Noticed a difference in the quality of my dogs coat since using VetUK's own brand products. These treats are a great complement to my dogs diet.